Ahmedabad : A dalit youth who have his owned horse, on Thursday evening, was allegedly hacked to death by three upper caste persons at Umrala village of Bhavnagar in Gujarat. 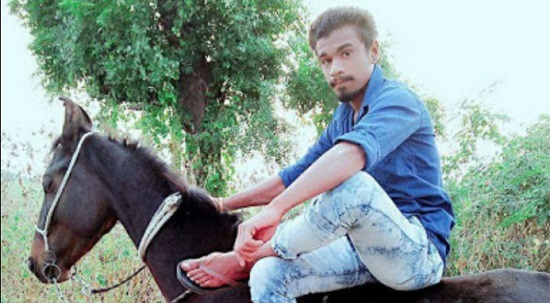 Pradeep Rathod, the 21-year-old dalit youth, alleged he was killed for owning a horse, police are investigating other angles like personal rivalry and a love affair as well. On Friday, following protests from the family of the youth, Pradeep Rathod, and other residents of Timbi village in Umrala taluka, police said they were questioning three men in connection with the murder. All the three are from the Kshatriya community, police said. Late in the evening, the horse, Raju, led the procession of mourners for Rathod’s funeral. “We wanted to carry the body in a horse carriage as a mark of protest. But since a carriage couldn’t be arranged, we ensured that the horse led the funeral procession,” said Aravind Makwana, a Dalit social worker. Kalu Rathod, Pradeep's father, claimed the upper caste men were not happy with Pradeep riding a horse as he hailed from a backward community and had threatened to kill him if he didn't stop. The police arrested three persons in connection with the murder, after Pradeep's family refused to accept the body if the culprits were not arrested. According to a complaint lodged with the Umrala Police, Kalu said that one Natubha Darbar from the nearby Timbi village made death threats to Pradeep and a few other youth if they didn't stop flaunting the horse. Kalu said, "My son had gone to our farm on a horse. While returning, he called to say he will join us for dinner, but he didn't come back till late. We set out looking for him and found his body near a road to our farm." “Even after that incident, Kshatriya men from Piprali continued to issue death threats to my son. Moreover, Natubha, who is married to a woman from my village, had threatened to kill my son around two weeks ago if he did not give up riding a horse… The men from Piprali and Natubha hatched a conspiracy on March 29 and murdered my son,” Kalu alleged. Demanding action against those responsible for the crime, the family refused to accept Pradeep's body for cremation.